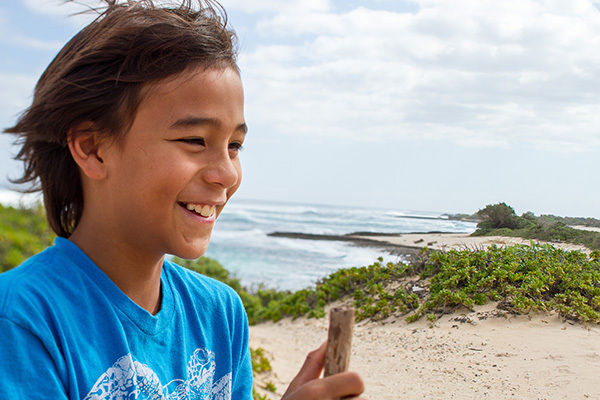 Stretching five miles from Kawela Bay to Kahuku Point, the land surrounding the Turtle Bay Resort embraces one of the last undeveloped wild shorelines on O'ahu. This rugged, windswept coast is home to endangered monk seals, green sea turtles, and whales that breach just off shore in the crystal-clear ocean. Residents and tourists alike flock here to get away from O'ahu's urban centers, and enjoy uncrowded beaches, surfing, fishing, and hiking. But the future of this rare coastline was endangered by development rights granted decades ago that have withstood multiple legal challenges. Approved plans called for five new hotels, thousands of resort residences, and additional shopping and commercial centers. For years, development on this coast was fervently opposed by all who love O'ahu's wild North Shore. The Trust for Public Land, in partnership with the North Shore Community Land Trust, worked tirelessly to negotiate a conservation agreement with the State of Hawai'i, the City and County of Honolulu, and the landowner. The Trust for Public Land secured $2.5 million from the U.S. Army to complete the $45 million effort. In October 2015, we completed the historic agreement to conserve 630 acres of this irreplaceable wild shoreline, assuring that these beautiful lands will remain undeveloped forever.